Resident of Druze town of Majdal Shams injured after shots fired from Syria. A resident of the Druze town of Majdal Shams in the Golan Heights was shot in a suspected terrorist attack as he stood near to the border with Syria Saturday. The 19-year-old man, said he clearly heard a gun fire before being hit in the foot by a bullet, apparently fired from the Syrian side of the border. The victim was admitted to hospital in light-to-moderate condition. The IDF and local police have launched an investigation into the incident, saying that at this point they are unaware of any unusual incidents along the northern border. This would not be the first time fighting from the Syrian civil war - which has raged for nearly three years and claimed more than 130,000 lives since 2011 - has spilled over into Israel. The last such incident occurred a month ago, when a mortar shell landed in Majdal Shams. The shell struck between two houses in the town, but did not cause any injuries. 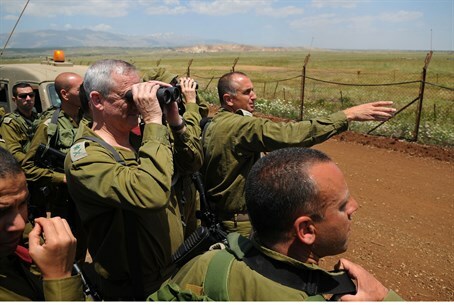 Following the incident, the IDF traded fire with a Syrian army outpost after coming under fire.